Undoubtedly, your first college year might seem rather expensive, since you need to buy new clothing, textbooks and gadgets for your studies, probably some furniture into the place you are going to live in, etc. Luckily, as a student, you are eligible for sweet student discounts that will certainly ease the transaction. 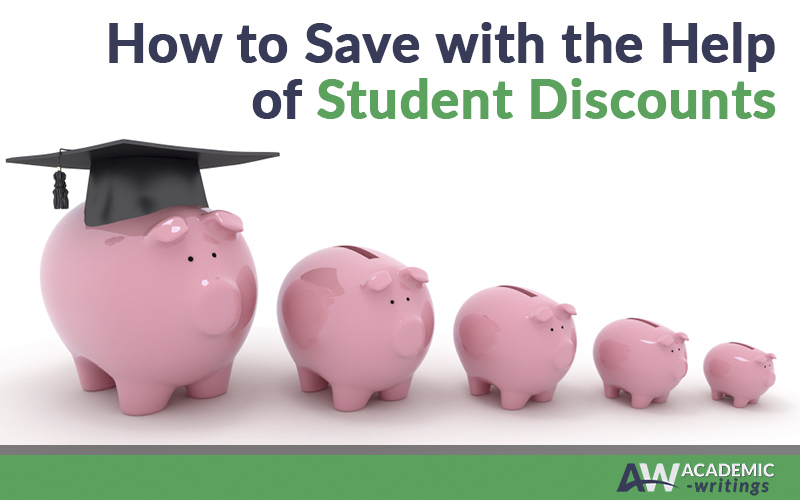 Where and how can you get your student discounts? Where can you buy cheap books and school supplies? The following places will help you get the essentials with good student discounts. Amazon. Here you can get nice deals on both new and used textbooks. The main advantage of Amazon is that it provides discounts all year round. Big Words. This comparison shopping website provides information about textbook deals across a wide range of retailers. The Economist. The Economist offers good discounts on subscriptions for all the students regardless the school. I am sure you want to get a new wardrobe as well. Therefore, here is a list of stores that can help you with getting new clothing items or updating the ones that don’t fit anymore. Ann Taylor. Ann Taylor gives 15% off full-priced items. Unfortunately, this discount doesn’t work with items on sale. It is also necessary to have a valid student ID handy. Club Monaco. Club Monaco offers a 20% discount. The main perk of shopping here is that it provides both in-store and online purchasing. Boohoo. Believe it or not, Boohoo offers 40% off on everything with UNiDAYS-verified student status. Sometimes, you also need to stock up some furniture. Why don’t you make your dorm room look a bit cozier with the following discounts? IKEA Family. Even though there are no special discounts for students, IKEA Family provides discounts and promotions with its free loyalty program. Pottery Barn. If you have .edu email address or student ID, you are more than welcome to get 15% discount on every item Pottery Barn offers. Another way to furnish your new room is to do some handiwork. Thus, you will get long lasting and customized items of furniture that will perfectly fit your style. One more thing you need to consider is buying technologies that might come handy during your college or university life. Upgrade your gadgets in the following stores in order to get high-quality techs at good prices. Adobe. Having a school email address allows you to get 60% off Creative Cloud subscriptions. Apple. Apple has always been friendly to students. Therefore, there are various discounts for students with UNiDays verified status. However, it is recommended to check for the best time to purchase Apple devices. If you haven’t found a needed discount in our list, the best option is to ask for it. Just remember to take your valid student ID or have .edu email address.